Meet the stars at the Dam! 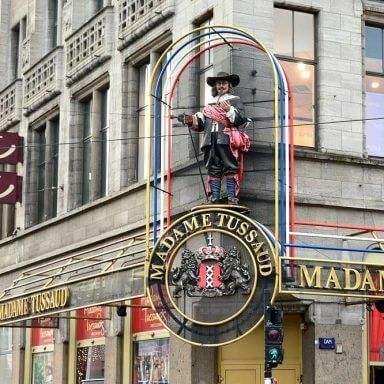 At Dam Square, perhaps the busiest part of Amsterdam, you’ll find the world-renowned waxwork museum Madame Tussauds. Movie stars, musicians, superheroes .. since 1972 you can see them all in Amsterdam. I’m honestly not really a fan of this kind of “museums” and had never been to Madame Tussauds. A friend and her daughter came to visit me in Amsterdam, so we decided to go to Madame Tussauds. Her daughter was really excited about it, my friend and I were a little less enthused. However, our preconceptions turned out to be less bad than we thought, we had a great time! My tip: Enjoy the wonderful view! Madame Tussauds is so full of famous figures that many visitors forget to look out of the window. 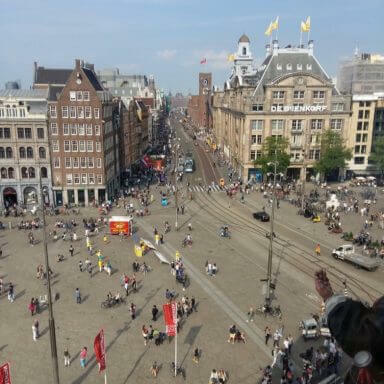 A pity, because of the location up high in the middle of town, you have a beautiful view of Amsterdam from Madame Tussauds! I expected the museum to be full of artists from recent years that I wouldn’t know. 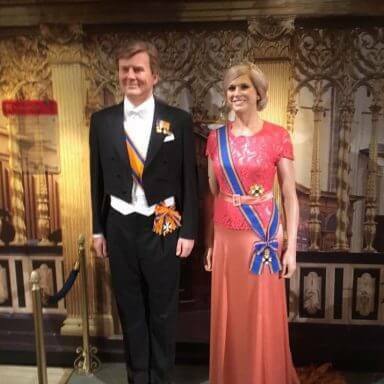 To my surprise, there was even a little Dutch culture in Madame Tussauds! 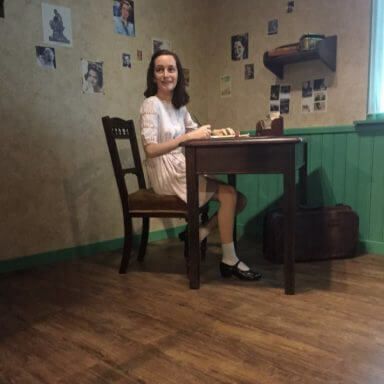 There are waxworks of Anne Frank and Vincent van Gogh, among others. The Royal Family is also represented. Besides these figures there were also a lot of Dutch DJs, which was nice to see. The DJ scene is a source of Dutch pride. In addition to the figures mentioned above, you’ll also find lots of international artists and politicians. It’s always nice to see them up close and be amazed at how big or small they actually are! New exhibitions and interactive elements are regularly opened at Madam Tussauds. There are always a few activities especially for children, but also for all ages. You can sing along with a number of artists, or read a speech with King Willem-Alexander and Queen Maxima. This makes the museum very interactive and the children clearly enjoyed this. Who wants to have a photo taken with the King and Queen? I think that anyone can enjoy themselves at Madam Tussauds, from young to old. The waxworks they have are so diverse that there are recognisable and popular people for any age group. Today I went to Amsterdam with the family and we visited Madame Tussauds. We’d already bought tickets so didn’t have to wait in the long queue. We enjoyed it – so many super realistic figure, not too busy. You can take nice photos everywhere. Definitely worth the trip! In Amsterdam it’s always busy and there are often long queues at Madame Tussauds too. I have to say I don’t like waiting, so I always try to buy online tickets for visits to attractions. If you also want to avoid the queue you can buy tickets here. Of course you can also buy tickets there on the day. Madame Tussauds is open every day from 10am to 9:30pm. You can buy a ticket and enter until 8pm. During holidays the museum opens at 9am and closes at 5:30pm. You can enter until 4:30pm. To avoid the busy periods it’s best to visit outside of school holidays and not at weekends. If you have to go during the holidays, it’s best to go in the morning. At that time it’s relatively quiet and you can take photos of all your favourite waxworks at your own pace. Madame Tussauds is quite expensive, especially if you’re going with your whole family or a group of friends. Luckily, you can save a few Euro by booking your tickets online, which is nice! Madame Tussauds is right in the centre of Amsterdam, situated in the biggest square, the Dam. I would recommend you take public transport to get there. From the Central Station it’s only an 800m walk but if you think that’s a little too far, you can always take the tram which stops at the Dam Square. If you really want to take the car to Madame Tussauds, you can try to park in the Bijenkorf car park, also situated at Dam Square. Be careful though – the prices in this car park are not cheap! I got to met celebrities I never once been able to. I’d recommend this to star junkets out there. 636 visitors rated Madame Tussauds Amsterdam average 4.58 stars out of 5.